NOVEMBER 24, 2015 — In a recent Chronicle Open Forum (November 20, “We Can Resolve Housing Crisis With Teamwork”) Gabriel Metcalf, Executive Director of SPUR, penned an oddly argued, personal, upbeat exhortation about how our affordable housing crisis is going to be solved if we just understand that “its going to be OK.” He says we can take his word for it: “I want to say to everyone already here, as compassionately as I can, is that its going to be OK.” He says that if we “take taller buildings,” “take more transit,” and “make room for more people” “it’s going to be OK.” That’s pretty much the sum total of his argument. It seems clear that Metcalf’s reason for directing his remarks to “everyone already here” is that so many of us simply do not agree that under current development policy, strongly urged by Metcalf’s organization, SPUR, that “everything is going to be OK” for the obvious reason that everything, now and in the recent past, has not been “OK” and it’s clear for all to see which is why Metcalf’s musings are so odd. In the same edition of the Chronicle that his article ran — November 23 — three stories made this point. San Franciscans correctly understand that the housing crisis we face is one of affordability, that housing affordability is dependent on household income and that household income, for San Franciscans, is often dependent on the ability of local businesses to continue to be located in San Francisco. The three go hand in hand and are, all three, dependent on a system of informed local land use policy that integrates the three (see Section 101 of the San Francisco Planning Code, drafted by the people and made law by the passage of Prop M in 1986 ). We need a comprehensive development policy that places housing in its true social context, that protects and enhances our neighborhoods, communities and businesses, that preserves space for the arts, the very young and the very old. To do that will produce real social change that will preserve and enhance a city not only for us but all in the world who, like us, yearn for such a place to live. I love San Francisco, and have been proud to call it home for nearly 20 years. We have a golden opportunity to show off our best features to all the visitors making their way here for the Super Bowl. We should put our best foot forward. The Super Bowl 50 committee has requested SFMTA remove overhead Muni lines along Market Street. Dismantling public transit in this heavily trafficked corridor in preparation for that influx of people is not the way to showcase our city. We will need moreways to move people around the city, not fewer. 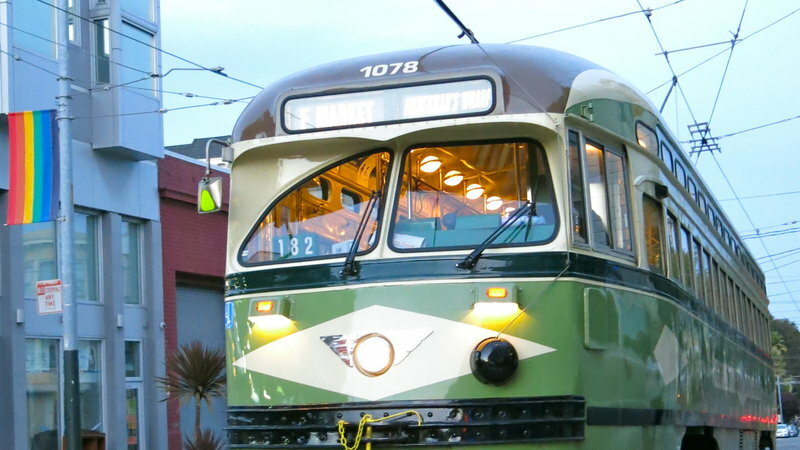 The overhead power lines are a part of the city and its character, they are far from “unsightly.” Plus, the streetcars they service are a great bit of San Francisco charm. I live on one side of the city and work on the other. Commuting on MUNI during this period was already going to be difficult, but this proposal would make it nigh impossible. And the cost of this request is expected to run “seven figures” and necessitate “lots of overtime.” This disruption will last much longer than the 8 days leading up to the game. I urge the Citizen Advisory Council recommend SFMTA reject this proposal on December 3rd. Impacts on the housing market from transit corridors – rising rents. The astronomical rise in property values is caused by removing height limits and zoning restrictions. Add massive evictions and foreclosures and create a new disruptive quasi-hotel business for transient citizens and you can easily create a housing shortage to boost property values even higher. Forcing people to give up their cars is one of many tools the new building industrial complex uses to force dense stack and pack housing on a population that hates it. City Hall uses your tax dollars to market their vision of your future by trying to shame you into accepting what they have plan to do to you.